Sorry for a few days of no entries. Last Wednesday and Thursday I was down in Singapore on a border run. This is a technicality based on the type of work visa I have for Thailand. If you want to know more, you can read this entry about it, which includes a funny video about a typical border run. The visit was fun, including a dinner with Singaporean friends that I’ll share pictures of soon along with a nice lunch with two Xangans, Monica (icepearlz) and Nick (beowulf222). I’ve known Nick for a few years independent of Xanga and it is always nice to see him again. This was the first time I’ve met Monica. I know many of you read her accounts of life (and motherhood) in Singapore, and let me assure you that she’s every bit as nice in person as she is on her blog. While waiting in the lobby of my condo I noticed this butterfly perched on a beam near the ceiling. Was able to get quite close for the shot, although lighting wasn’t ideal. Beautiful creature, isn’t it? Upon returning to Bangkok, I was engulfed by the news of the earthquake in Japan as I’m sure many of you were. Instead of sitting down to blog, I was turning my attention to reports from that nation and my thoughts to the many friends Tawn and I have there. Thankfully, they are all well and suffered no damage other than the emotional discomfort one would expect from such an experience. I grew up in the San Francisco Bay Area and experienced countless quakes, including the Loma Prieta quake in 1989. While not as severe as this recent quake in Japan, I can sympathize with the feeling of utter helplessness as the ground shifts beneath your feet. In the next day or two I’ll resume regular blogging, writing about food, cooking, and observations about life in Bangkok. But for today I’ll just leave it at this. I love the colors on the butterfly- so beautiful! Butterfy is a sign of good things to come. How nice to be able to have a short fly to neighboring countries, and exprience other cultures and cuisines. It’s just heart breaking watching those scenes unfold. I can’t even comprehend what those folks are going through. Beautiful, indeed. I’m glad you had a good time with them friends and Xangans! And, yes, what happened in Japan and the things that they must go through as a result of it is just overwhelming. that butterfly is beautiful — amazing that you could get that close to get a picture!what happened in japan is devastating. i’m thankful that anyone i know who is either in japan or has relatives in japan so far has managed to contact them and determine that they are doing ok. i’m also very thankful that the tsunami didn’t do too much damage in hawaii! Chris, I am so happy your friends are all doing well. I am very worried about Gerald, a xangan ( gentemann ). He lives there and used to be a regular on my blog. I haven’t seen him these last two days, and I have a sick feeling in the pit of my stomach. He ALWAYS always, writes anything that happens in Japan, from the new coca cola fads to various technologies. Would you know any thing about him? God Grant that he and his family is doing well. I love the colors nature uses to adorn animals. And so delicate too. I fear for the people in Japan. Everything I hear on the news makes it look worse and worse. That Japan event really did stop a lot of us in our tracks when we heard about it. That’s good your friends in the nearby area weren’t really affected. It was nice meeting you too, Chris. @The_Eyes_Of_A_Painter – I sure hope that’s what the butterfly symbolizes. 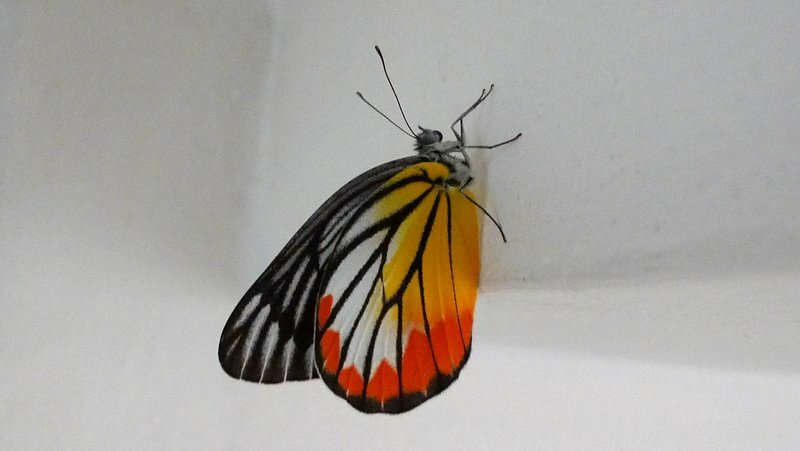 We are all watching the news concerning Japan… great photo of the butterfly – can you identify it? @murisopsis – Have no idea what it is, although it reminds me a bit of the Monarch butterflies we used to see in Northern California. @Roadlesstaken – @nov_way – @ElusiveWords – These events always serve to remind us that, yes, it could happen “here”, too. @Fatcat723 – @Dezinerdreams – Nature has an expansive palette with which to work, I think. @ZSA_MD – Seems that he and his are safe and sound. @kunhuo42 – Yeah, I was following the news for Hawai’i but thankfully there and on the West Coast it was relatively minor.